Digital marketing is the future of marketing so you want to make sure that you and your business are always updated . Our team is ready, waiting and excited to work with your brand and formulate creative ideas that will ensure that all you get the best if what the digital industry has to offer and enhance your customer’s experience and increase online engagement. Do you have a Facebook book page and are all “liked” out? You don’t have to wonder what comes next. At Web Creation Africa, we understand that it is our job to formulate strategies that will boost activity for your social media pages and online marketing. We will help you create and build applications that will make your customer experience journey unforgettable. LinkedIn Apps- our team can help you develop a LinkedIn application or a unique company page to tap into the leading human resource. The latest GMSA Report show s that Sub-Saharan Africa’s unique mobile subscriber base has grown by 18 per cent annually over the last five years, making it the fastest growing region globally. With the region leading the globe in mobile growth and impact it is paramount for African brands to get their business onto mobile platforms and we are here to help you do just that. 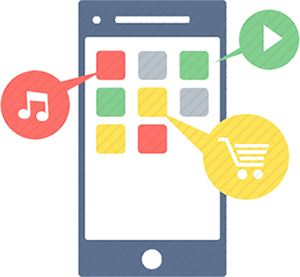 Mobile app development is one of the best and most enjoyable ways for consumers to engage with brands. Tablet Applications-New generation computers have evolved into modern day hand held tablets Discuss with Web Creation Africa if your website is compatible or if you require an application. Smart Phone Applications-Your brand should be getting on the fastest growing social applications race this year. Discuss your iPhone and Android application ideas with us in confidence and we will help you develop and run them.